Can Twins Sleep in the Same Crib? 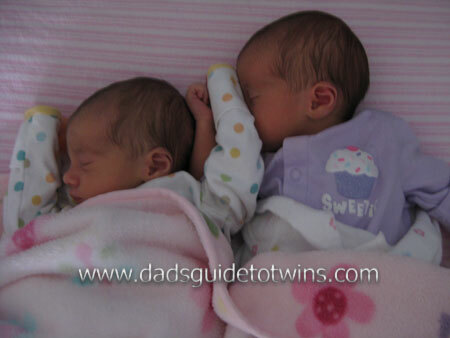 When you bring your baby twins home, can you let them sleep in the same crib? At the hospital, the nurses had our twins together in the same bassinet. When we got home, we just continued this pattern. From their time in utero, each twin has constantly been with their sibling. Why not continue? Do twins need their own crib? 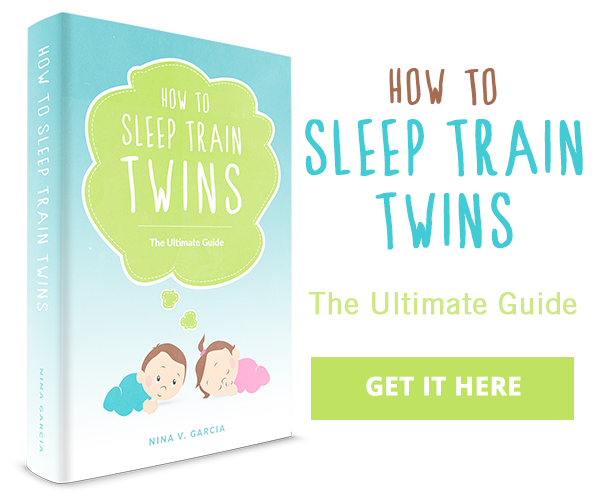 Current safe sleep recommendations for twins are that each twin has his or her own crib. 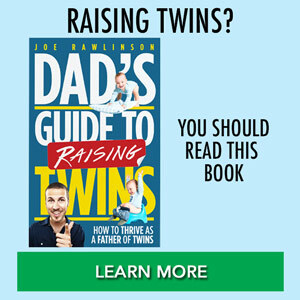 Let’s look into some of the challenges of this recommendation for twin parents and what worked in our family when our girls were babies. When we brought our twin babies home, we already had two older boys (both under the age of 3). One of our sons was still in a crib. We knew we wanted to eventually move him to a big bed and then move his crib to our twins’ nursery, so we only started with one crib in our twins’ room. From the day our girls came home from the hospital, they shared a crib. We found that our babies would actually turn towards each other when they were sleeping side by side in the same crib. As newborns, your babies aren’t going to move around much so where you put them is where they will stay. In the crib, this means that we could have both babies sleep together without them interfering with each other too much. Where Are Your Twins Sleeping? Evaluate your home and your twins’ sleeping arrangements. Is their room upstairs or in a far-off corner of the house? Do you want the convenience of having your twins close to your master bedroom for nighttime care? Current medical recommendations are that your babies sleep in the same room as you for the first year. With twins, the logistics of this can be quite challenging or even impossible. Do what you feel is best for your family. Clever baby gear like the Romp & Roost Playard or HALO Bassinest helps you fit two babies in the smaller space of your room when you don’t have room for two cribs. Do you need two cribs for twins? Yes, eventually you will. Do you need to buy both right now? No. Many twin parents are tight on cash and can only afford one crib at a time. If this is your situation, you can space out the crib purchases over time so that you don’t have a huge expense all at once. Or ask for cribs as baby shower gifts or from the grandparents! Eventually, your babies will start to wiggle and hit each other when they share are a crib. Don’t freak out. They were doing this in the womb for months (just ask your wife). If it doesn’t bother them, it shouldn’t bother you. How long can twins stay in one crib? We kept our girls in the same crib for several months until they started getting bigger and rotating around. We knew it was time to separate when were jarred from sleep because Twin A had put her foot in Twin B’s head and Twin B was crying. When that time arrived, we put two cribs in the same room, with one baby in each. The girls seemed to miss each other at first but would call out to each other via squawks or gurgles in a form of echolocation (think bats) to make sure their sister was near. So you may ask: Don’t they wake each other up if they sleep in the same room or crib? No, not necessarily. 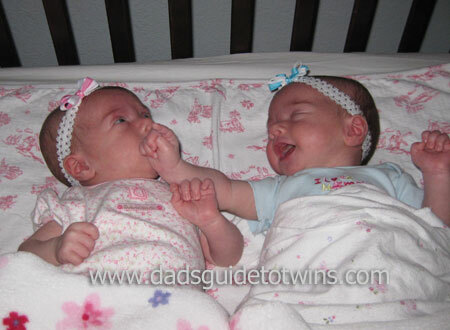 Typically one twin can sleep through the cries of the other. You’ll even find one of your babies with arms or legs sprawled over the other with both twins sleeping contently. As a twin parent, you have to balance current medical recommendations with the reality of your home situation. Space constraints, budget limitations, and your personal parenting preferences must all be balanced when coming up with a solution. Our girls shared a crib just fine for several months. We’ve also heard of many other twin parents having success with this. On the other hand, remember that eventually, they will both need their own crib. If you can afford two cribs now and have space, start out with each twin in his or her own crib. 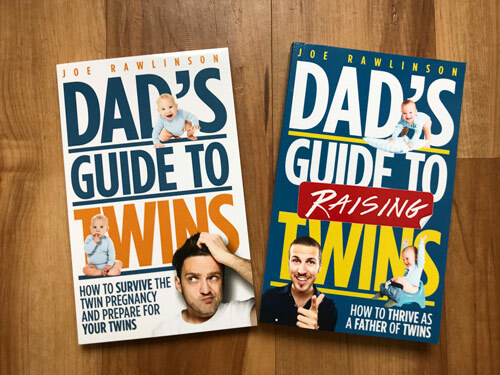 You’ll find more details about twin sleeping arrangements and overcoming sleep challenges in Chapter Five of my book, the Dad’s Guide to Raising Twins: How to Thrive as a Father of Twins. @Harriet: You’re welcome. While your niece will be able to use two cribs to start with, the time will come when she’ll need one for each baby. Nevertheless, while they are newborns, they should be OK sharing. awww that is sooo cute, you have adorable babys god bless them!! @Chantel: Thanks! We think they are cute too! I have 10 month old twin boys and they still enjoy sleeping together. One moves and the other doesn’t but i have never had a problem with them “beating each other up” during the night! @Rhonda – Wow! 10 months is a good stretch. Our girls didn’t last that long in the same crib. Even though our girls are separated now, they still typically sleep through each other’s snoring and noises during the night. Hi I just wonder what is the size of the crib that can take both of them???? @Mona – Just a regular size baby crib will easily hold two newborn twins. The challenge comes when they start to roll around and disturb each other. When you moved to two cribs, was it essential to put them next to each other? if so, did you put the ‘short sides’ against the wall and have them stick out in the room or could they be on two separate walls about 10 ft apart with a ‘long side’ against a wall? We have a strange room config and trying to think through furniture placement. @Marla – They don’t need to be right next to each other. We had ours with the short sides against the same wall and sticking out into the room. However, your twins should be fine even farther apart. As I mentioned in the article, our girls would make sounds to try and get the other’s attention. 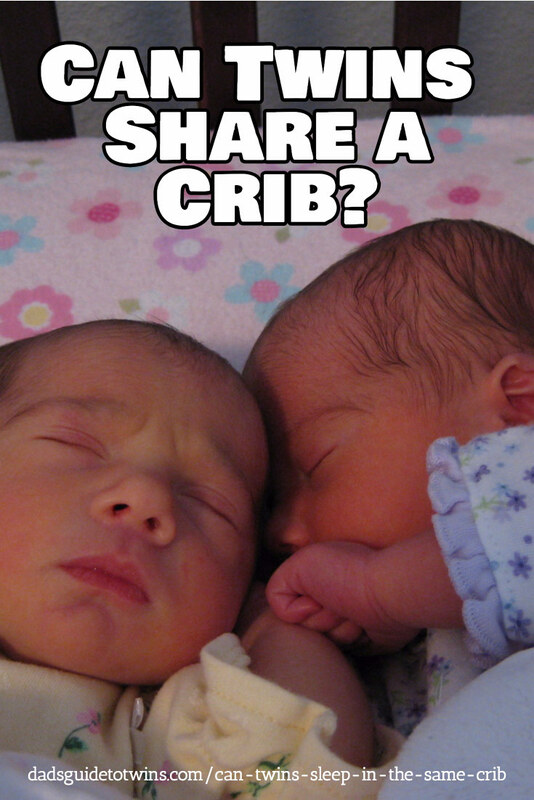 Your twins may likely do this regardless of distance between cribs. Eventually your twins will get so big that they can stand up and reach each other if the cribs are side by side. You’ll want to move them across the room from each other to help encourage sleeping. Thank you Joe, this was extremely helpful! @Sharon – You’re welcome! I’m glad to help. My boys are almost 15mo and still sleep together and I start them off not touching but they will purposely be together. I’ve tries seperate but that didn’t work. We are just waiting for the right time to go to toddler beds instead of buying another crib for a couple months. Ur twins are cute! @Jessye – our girls always moved toward each other when they shared the same crib too. If you can hold out long enough to go straight to toddler beds it will definitely save you some money.